The sunnies were last worn here, dress here and bag here. This is the first time I've worn the shoes on the blog. A nice bright red dress seemed fitting for Valentine's day! Hope you have a lovely day, if you are in a couple or if you're single. DH has to work tonight so we are having a quiet one. The dress was last worn here, sandals here and bag here. The colour of your bag is so pretty! Wow, I love both of those dresses so much!! Those pink accessories go SO well with the first dress too. Fabulous! Happy Valentine's Day!! That red dress is simply perfect for the holiday :) I hope you have a really lovely Valentine's Day, even if it is quiet. Both of looks are adorable! My fav is the 2nd one, but I really love your pink balenciaga! Whoa, Mica you just look gorgeous in both dresses! Enter to win a $40 voucher! both outfits are so cute :) the red dress is very festive! happy valentine's day! I can picture you wearing that pretty polka dot dress over a white crisp button down shirt and looking winter ready. And the red dress is so pretty ! i like how you dressed it down with flats and a big gorgeous bag. I love love love both dresses especially the red one! love that red dress, it's so cute! Both of your dresses are amazing. I especially love the little red one. And that chevron bracelet is pretty fabulous. Both look are cute! And your dog, is very adorable! Happy Valentine's Day my friend! Both the polka dot dress and the red dress look stunning on you:)! I love both dresses! You look amazing with that red dress. 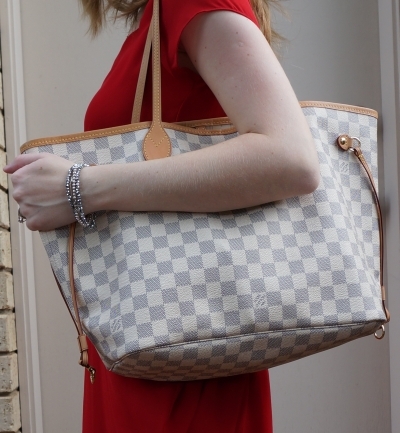 Oh, that LV purse is my DREAM BAG! Love it! & both of these dresses are so gorgeous. I love when people wear orange! Since it seems people rarely do...you look fab! You're looking SO beautiful in both outfits ! Especially red suits you and makes the whole look really fresh I think :) Lovely. I love your red valentine's day dress, so beautiful! That red dress looks absolutely stunning on you! Or better said, you look stunning wearing it! :) Hope you had a great Valentines Day! aww you looked beautiful on Valentine's Day!!! Very cute polka dot dress!